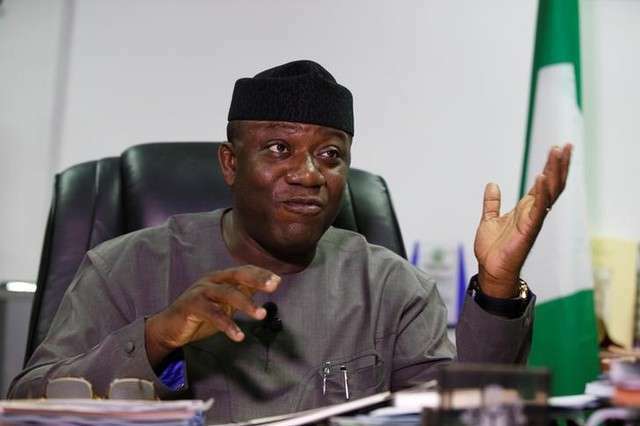 Governor Kayode Fayemi of Ekiti State, on Wednesday, urged the Senate to intervene on the refund of N21 billion spent on construction and rehabilitation of federal roads in the state. The governor made the appeal while receiving in audience members of the Senate Committee on Works who were on an inspection visit to federal roads and other projects in the state as part of their oversight functions. The Senate Committee, led by its chairman, Sen. Kabiru Gaya, was received on behalf of the governor by his deputy, Otunba Bisi Egbeyemi. According to a statement, on Wednesday, by the Special Assistant (Media) to the deputy governor, Odunayo Ogunmola, other members of the Committee on the visit include Sen. Biodun Olujimi, Sen. Clifford Odia and Sen. Mustapha Sani. The senators were joined by staff members of the National Assembly and officials of Federal Roads Maintenance Agency (FERMA). Fayemi added that he was not yet satisfied with the number of federal projects in the state noting that he would not relent until projects like railways and airport become reality in the state. He argued that no amount had been refunded despite the fact that Minister of Works, Power and Housing, Mr. Babatunde Fashola, certified the expenditure of N11 billion out of the N21 billion spent by the Ekiti State Government on the maintenance of federal roads across the state. The governor further solicited the intervention of the Federal Government in the completion of the dualisation of Ado-Akure Road and the rehabilitation of Ado-Aramoko-Ijero Road, Ado-Ifaki-Ilorin Road and Ifaki-Omuo Road. Fayemi said, â€œWe wish to use the opportunity of your visit to also present the following request to you, trusting you that you will use your good office to help us. â€œThe Ado-Ifaki-Ilorin Road, part of which was reconstructed the other time, but were badly done, we wish you travel on these roads, especially Ado-Ilorin Road. â€œThen apart from that, Ifaki-Omuo Road is begging for total reconstruction. It is a journey that should not take more than an hour but now takes two hours, thirty minutes to get to the town. Earlier in his speech, Chairman, Senate Committee on Works, Senator Gaya, promised that more federal road projects in Ekiti State would be included in the 2019 Budget. Gaya said: â€œI learnt that there were few projects done by Federal Government in the state even though Senator Biodun Olujimi and Sen. Fatimat Raji Rasaki are working hard to ensure that new projects come into the state. â€œPresently we are working on Efon Alaaye-Itawure-Iwaraja Road. Hopefully, the contractor handling the project will deliver it by March next year.